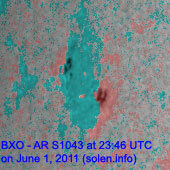 Last major update issued on June 2, 2011 at 05:25 UTC. 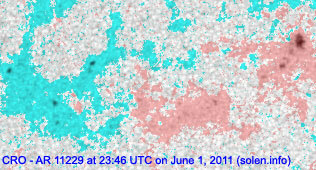 The geomagnetic field was quiet to unsettled on June 1. 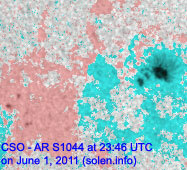 Solar wind speed ranged between 448 and 616 km/s under the diminishing influence of a high speed stream from CH451. 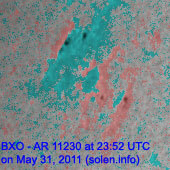 Solar flux measured at 20h UTC on 2.8 GHz was 113.6 (increasing 8.7 over the last solar rotation). 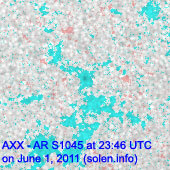 The planetary A index was 12 (STAR Ap - based on the mean of three hour interval ap indices: 11.9). 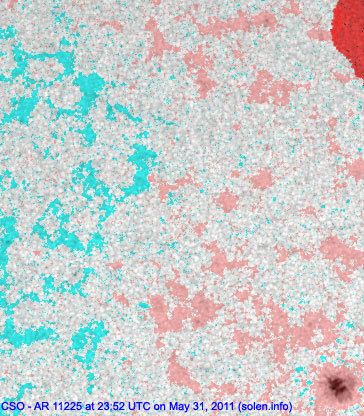 Three hour interval K indices: 31312333 (planetary), 31422312 (Boulder). 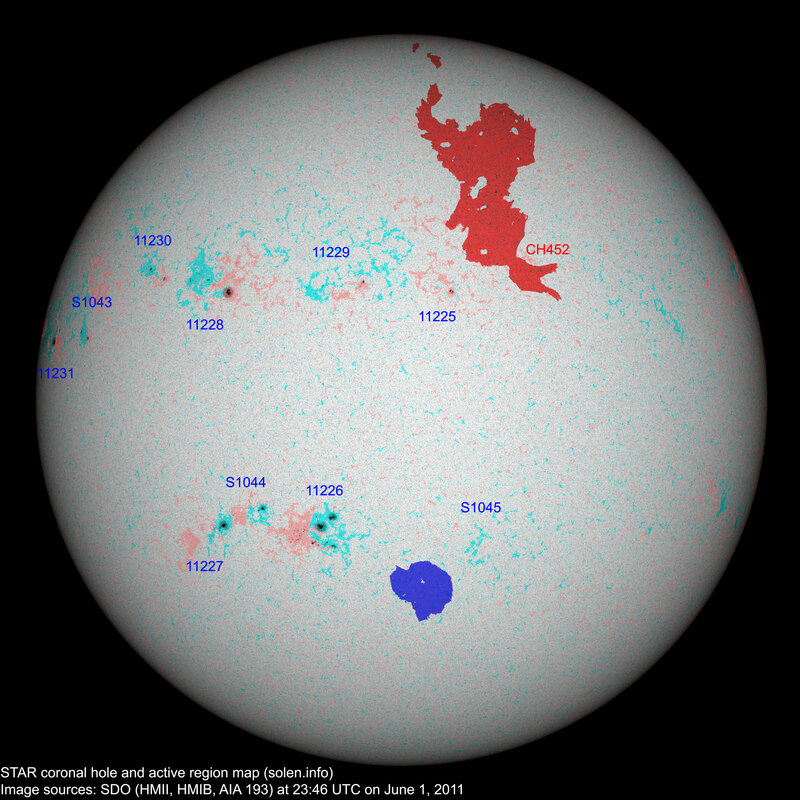 Region 11225 was quiet and stable. 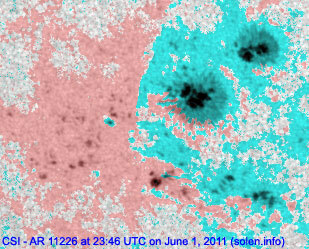 Region 11226 decayed slowly and still has minor polarity intermixing. 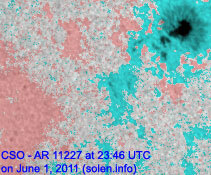 Further C flares are likely. 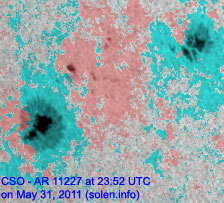 Flares: C1.6 at 16:16, C2.9 at 16:31, C4.1/1F long duration event peaking at 17:08 UTC. 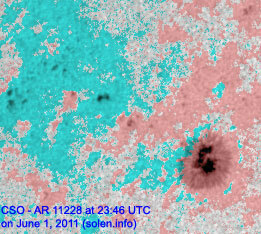 The latter event was associated with a filament eruption to the north of the region and a CME. 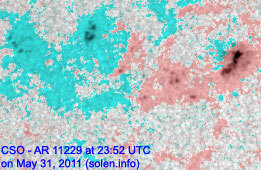 Region 11227 was quiet and stable. Region 11229 decayed slowly and was quiet. 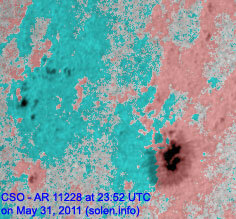 Region 11230 was quiet and stable. 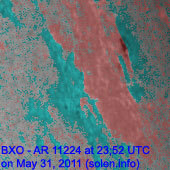 New region 11231 rotated partly into view at the northeast limb on May 31 and was numbered the next day by NOAA/SWPC. 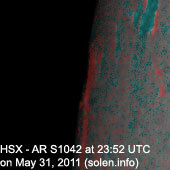 May 30-31: No obviously Earth directed CMEs were observed in LASCO and STEREO imagery. 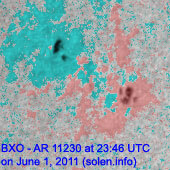 June 1: An apparently Earth directed CME was observed after the C4 event in and to the north of region 11226. 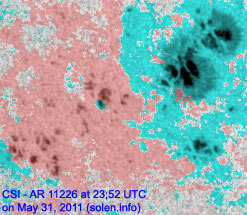 The southernmost extension of a large coronal hole (CH452) in the northern hemisphere was in an Earth facing position on May 30-31. 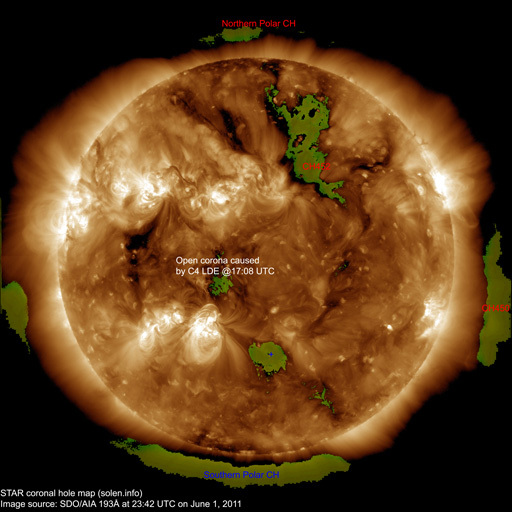 The geomagnetic field is expected to be quiet to active on June 2-3 due to effects from CH452. 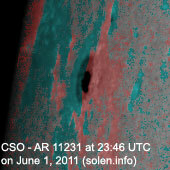 The CME observed on June 1 could arrive on June 4 and cause unsettled to minor storm conditions.